Dimensions 0 by 5 by 9 in. 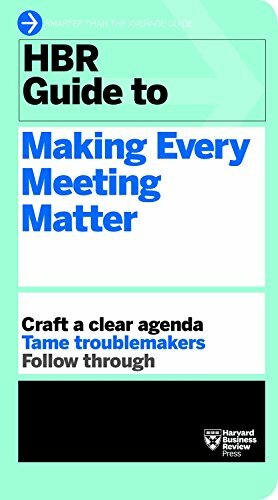 Your calendar is full, and yet your meetings donât always seem to advance your work. Problems often arise with unrealistic or vague agendas, off-track conversations, tuned-out participants who donât know why theyâre there, and follow-up notes that no one readsâor acts on. Meetings can feel like a waste of time. But when you invest a little energy in preparing yourself and your participants, youâll stay focused, solve problems, gain consensus, and leave each meeting ready to take action. About: Make every minute count.